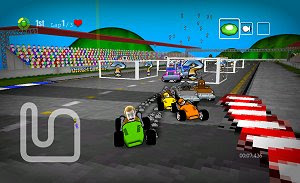 Dirchie Kart is one for fans of Mario Kart and other fun racing games. Clearly inspired by the Nintendo classic and other games of the 16-bit period, the player races against the computer or joins three friends for exciting races in multiplayer split-screen. About a dozen tracks are available and can be played in a single race or in the championship mode. Naturally, the tracks are filled with power-ups (eight in total) that are as surprising as devastating to the opponents. Several game modes (battle, drag and time-trial) help spice up the races. Dirchie Kart was created by a one-man team that did all the graphics, programming and sound and includes a very satisfying physics model and challenging AI. The game is available for purchase on XBLA but is a completely freeware game on PC!